With one foot in Alameda, one in Mendocino County—I will be joining two artists in a show at the Scharffenberger Cellers in the beautiful Anderson Valley. I will be bringing some urban scenes to balance out the bucolic! 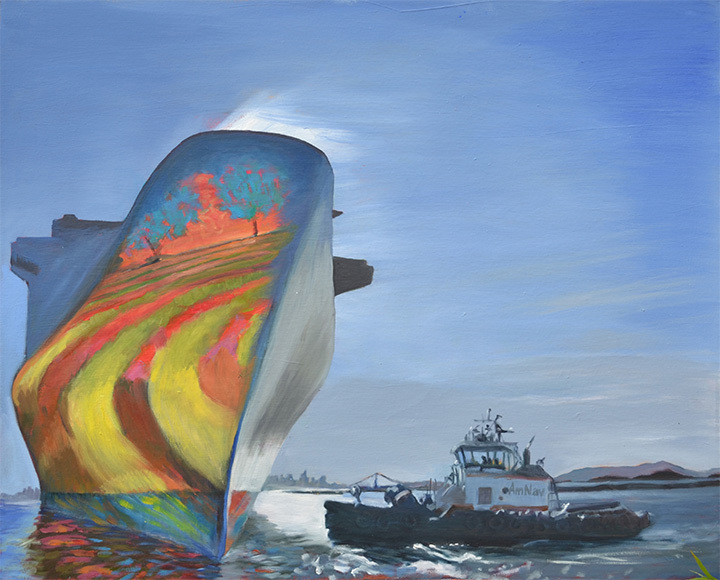 I knew the two ships I painted a few years ago were going to be moved out to other ports, so I went down to Alameda Island with my camera to see if I could capture them again. I happened to get there on the very day they were being moved! I counted myself super lucky, and stuck around to watch & photograph what I thought would be a relatively quick process. 4 hours later, they were gone! I got to hang around with some of the sailers, both women and men, from nearby ships who were happy to see them leave and in high humor. One of the ships is named the Algol. I didn’t stick to “reality” with the colors, as that grey-painted steel can be pretty dreary. 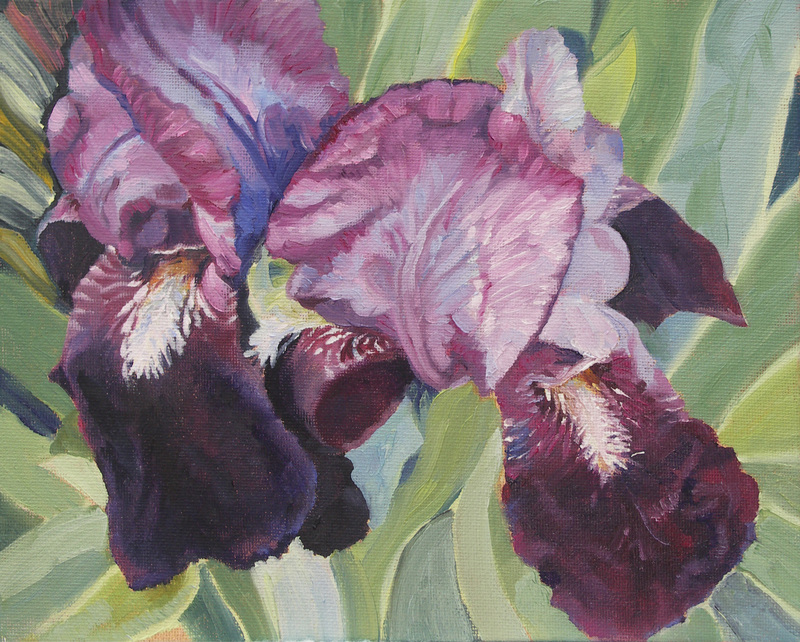 Irises have a lot of style, as far as flowers go. They are more shapely, and have more presence than your average 5-petalled, even-tempered type! It is a challenge getting the right purple, though. Some colors which exist in nature simply do not exist in paint. I worked and worked and worked on the color, and though I like it, I never quite achieved the purple I could see on the flowers themselves. Here’s my second 2-hour oil sketch from the day — the water needs work, but I like the colors. 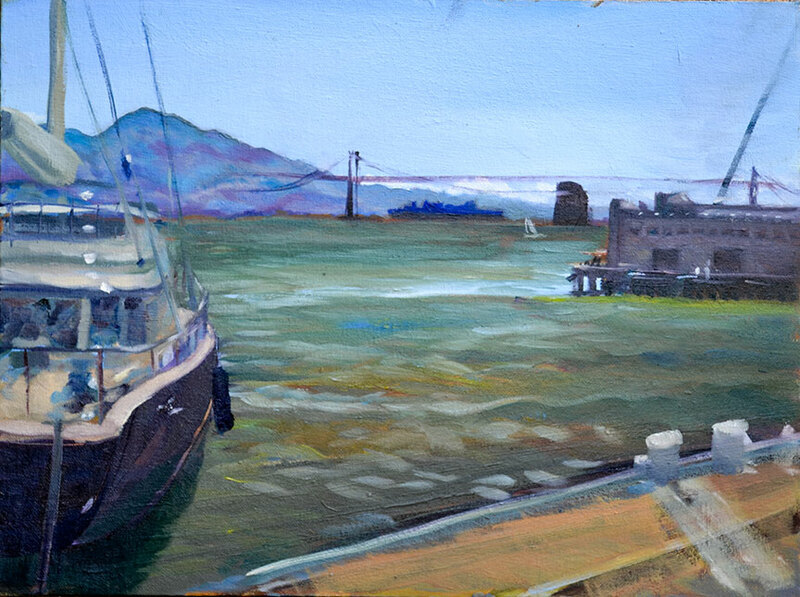 It’s an impossible view of the Bay Area, with Mt Tam in the background just for fun! 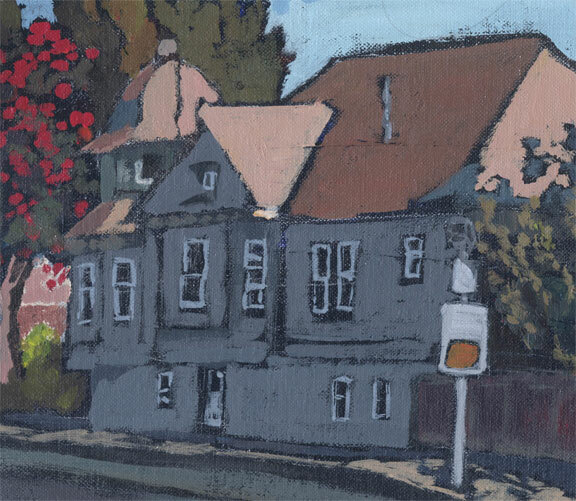 here’s a preview detail of an unfinished painting of a house on Lincoln Street just a few blocks away from the Frank Bette center in Alameda. I think I’ll call it “Island Living” – it’s really all about the speed limits, 25-35 mph all over the island! Come to the show and sale at the South Shore shopping center if you’re nearby, it’s on THIS COMING SATURDAY, all day, pretty much.